Stock valuations are the discounted values of future earnings. Future earnings depend on future revenue, which may diminish whenever the future includes a recession. So, broad economic conditions are a big factor to watch in stock valuation. Broad economic conditions depend ultimately on the consumer’s ability and willingness to spend money. And July’s retail sales report gave us a peek at that. Core retail sales rose 0.6% from June. The uptick was more than analysts expected, and most categories were up, too. The exceptions were clothing and electronics sales. The latter may have to do with potential smartphone buyers waiting to see new iPhone models expected to debut this fall. Bottom line, after the slowest y/o/y core sales gain since March 2016 in June of 2.5%, they rose by 3.6% y/o/y in July, which is about in line with the 5-year average of 3.3%. This pace, though, still remains well below the 5%+ growth rates in the two prior recoveries. Here are some reasons why: Many consumers have jobs, but we know accelerating wage gains remain spotty; the savings rate is near the lowest level since 2008; and credit card debt, student loans, and car loans each total $1T+. Lastly, we know healthcare spending (high deductibles) and rent have dominated the budgets of many. The bulk of consumer debt (68%) is still in residential mortgages. Balances have climbed in recent years but remain below the 2007 peak. Both auto and, most significantly (and perhaps ominously), student loan balances have grown enough to offset the lower mortgage balances. 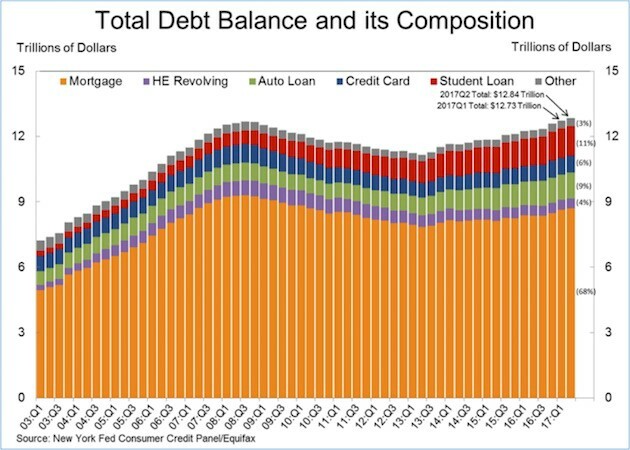 Total debt is close to where it was at the beginning of the last recession. Over time, GVA tracks nominal GDP closely, but they can diverge in the short run. That is happening right now. Three of the last four quarters brought Real GDP growth—albeit not much—while RVA was negative. 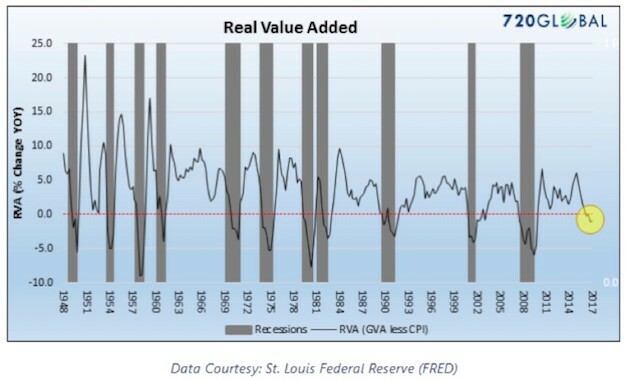 RVA below zero, as plotted below, is closely associated with the onset of recessions. This measurement technique is a little offbeat, but it is intriguing. Maybe this time is different, but we know from all kinds of other data that a recession should strike soon - by which I mean that one is quite possible in the next 12–18 months.